Korea Information Blog: What is Korea Sparkling? Some may know, but many people have no clue what Korea Sparkling is about (other than the fact it is related to Korea). Korea Sparkling was chosen as a slogan which symbolizes the lively energy that Korean people and culture have. 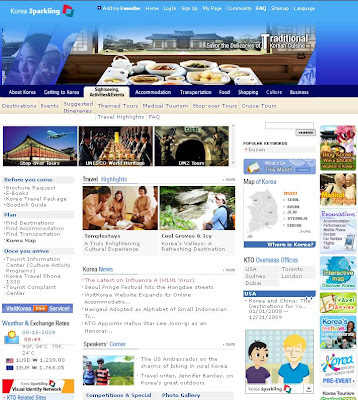 While Dynamic Korea will act as a national brand, Korea Sparkling will focus on the tourism purposes only. If you go to Korea Sparkling Website, this page will show up. You'll be amazed by how much information this site holds: sightseeing, transportation, food, entertainment, accommodation, events, shopping, etc. This is a promotion video for Korea, Sparkling. Personally, I think Korea Sparkling is doing a great job. In 2009 June, I went to Korean Festival in Toronto, Canada. There were lots of people and booths. I was walking by and saw Korea Sparkling booth (at the time, I did not know about it). Being curious, I went to the booth and when I got out, I had a bunch of Korean information brochures, a taekwondo poster and a buchae.